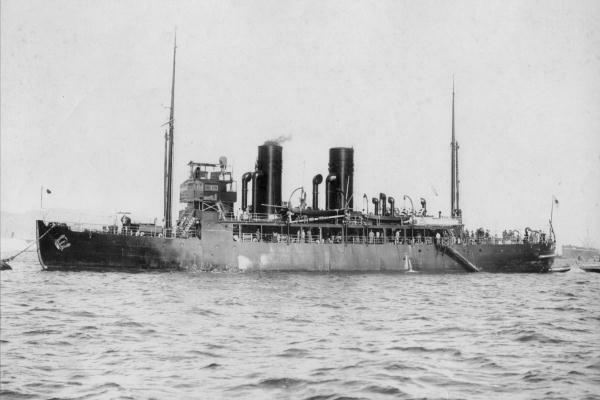 ODOMARI was purpose-built and equipped as the first Japanese naval icebreaker. The hull had modern ballast tanks and was able to withstand rocking movements for better icebreaking capability. The Imperial Navy established guard districts in the outer portions of the Japanese Empire. ODOMARI was based at the Ominato Guard District that had responsibility for the Kurile Islands and Karafuto. She performed icebreaking and fisheries protection services. In 1937-38, ODOMARI was rebuilt with a strengthened bow and raised hull. She survived the war, but the intent to use her as a repatriation transport ship was abandoned due to her heavy insulation, unsuitable for warmer climes. ODOMARI was laid up at Yokosuka until 1947 and finally broken up at Tsurumi in 1948-50. Propulsion: 2-shafts, 5 boilers, 3 straight 3-cylinder reciprocating engines 4,230-hp two-stage expansion (2 axis), 14 knots. Ice-breaking capacity : 2 meters.